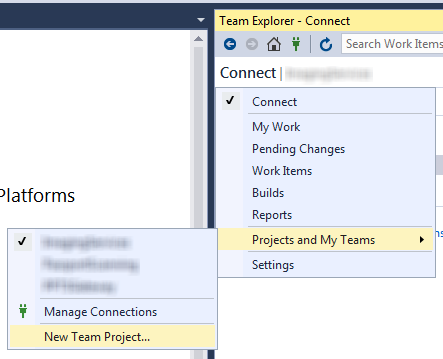 To get to the New Team Project menu in Visual Studio 2015 you need to go to Team Explorer and click on the dropdown bar at the top. Select 'Projects and My Teams' and you will see the 'New Team Project' menu item. Note: You do need to have the 'Create new projects' permission on the TFS Application tier to do this.